The rebellious student and budding young poet was Percy Bysshe Shelley the son of minor Sussex gentry. Having been thrown out of Oxford he promptly scandalised his family by eloping with Harriet Westbrook, the 16 year old daughter of a coffee house owner. In 1812 after a trip to Ireland, where Shelley published two pamphlets, An Address to the Irish People and Proposals for an Association of Philanthropists, and spoke at a public meeting at the Fishamble Theatre in support of the cause for Irish liberation, the Shelleys returned to England in need of respite and a place to relax and recover. They found themselves looking around the substantial country house and estate of Nantgwillt a few miles west of the town of Rhayader in central Wales. Within a mere 48 hours they had fallen in love with the romantic charm of the place and instigated negotiations to take a lease on the property. Shelley set about writing to his father for an advance on his inheritance so he could enter into the lease. 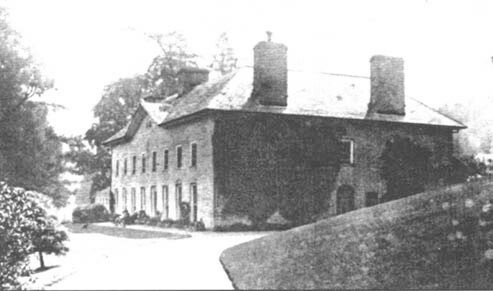 He also wrote to his ‘friends of liberty & truth’ painting a vision of the possibility for a commune of romantic radicals `…embosomed in the solitude of mountains, woods and rivers, silent, solitary and old… ‘ For eight weeks while Shelley tried to convince the estate staff of the merit of his egalitarian scheme; introducing communal meals and talking of self-fulfilment & the betterment of man. In the end too many complications piled up on one another and sank the scheme – not only could Shelley find no-one to back him financially, but the value of the stock and chattels on the estate had been doubled, and anyway he would have been unable to sign the lease himself, as he was still a minor. On the 7th June the little party left Nantgwillt, temporarily staying with relatives in the locality before moving off south. They settled next in the small Devon coastal village of Lynmouth taking a basic but somewhat rambling cottage, with enough rooms for Shelley to start to imagine trying to gather his ‘Friends of Liberty’ around him again. Since his dabble with Irish politics Shelly had been under surveillance by Lord Sidmouth’s Home Office. who employed a number of local officials as spies around the country. The inhabitants of the embryonic commune were too busy to notice the watchful eye of the law; setting up house, unpacking books and writing copious correspondence. (‘So many as sixteen letters by the same post’, Lord Sidmouth was informed.) Lynmouth may not seem the most strategic of places from which to try and disseminate radical propaganda, remote as it was from any centre of population and pretty much cut off from all communications. But Shelley overcame these seeming obstacles in a manner befitting a radical romantic poet. Early in the morning or late at night, picking their way along the rocky shore line at Lynmouth with arms and pockets full of bottles as the tide turned Shelley and his little band of conspirator’s would launch these little ‘vessels of heavenly medicine‘, out into the sea destined to be washed up to Avonmouth or across to South Wales. Each bottle held a copy of The Declaration of Rights or a broadsheet ballad called The Devil’s Walk. They also made small ‘boats’ – little waxed boxes with sticks attached to each end with a sail on to attract attention. One of these was picked up by a fisherman and its contents duly reported to the Home Office. Even more imaginative were the ‘balloons of knowledge‘, handmade miniature silk hot-air balloons powered by a spirit-soaked wick. Despite difficulties in getting them to fly – they tended to catch fire – numerous copies of The Declaration of Rights sailed away into the evening sky out across the Bristol Channel. During the long summer days Shelley worked on his long poem Queen Mab; a polemic attacking religious and political tyranny, war, commerce, marriage and prostitution, thinly disguised by a fairytale setting. Hoping to get round the censors by parading politics as poetry he wrote off to likely publishers. Life in the little embryonic commune was brought to an end after one of their number, Dan Healy, was caught putting up broadsheets in Barnstable. Interrogated by the local mayor he gave a pre-agreed cover story that he had met two travellers who had paid him to distribute the posters. However on finding that his master was already under suspicion, Healy was promptly tried and convicted of dispersing printed papers without the printer’s name on them. Not being able to pay the £200 fine he faced 6 months imprisonment. The magistrate sat back and waited for Mr Shelley to appear. Shelley came the next day. To the authorities’ surprise he neither admonished his servant nor paid the fine. 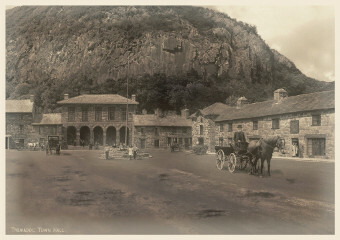 After a brief conversation with Dan Healy, in which it appeared to the authorities that the two men already had an ‘understanding on the matter’, Shelley departed back to Lynmouth and assuming that they were being followed Shelley and his small party hurried deep into Wales, possibly heading for Ireland. As they skirted the coast along Cardigan Bay they came across the site of not only one of the great civil engineering projects of the early 19th century, but also one of the most advanced community and commercial experiments of the period. In1801, the Irish Act of Union created the need for a clear route from London to Dublin There were two candidates for the route, up the A5, and then either along the north Welsh coast and on to Holyhead, or around Cardigan Bay and sail from the Llynn Peninsula. The northern route was blocked by the river crossing at Conwy and the Menai Straits and the southern route blocked by a large Glaslyn tidal estuary. 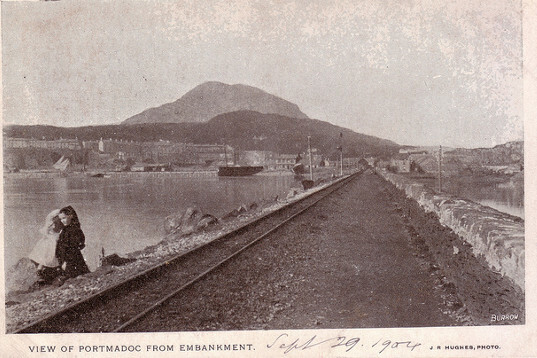 Local landowner, William Madocks, hoped to create the southern route by building an embankment across the estuary on which the main road could run and by building a harbour at Porth Dinllean. An initial ‘cob’ embankment had been built in 1800 reclaiming 2000 acres of tidal estuary. Here Madocks laid out the new settlement of Tremadoc under a dramatic cliff which rose several hundred feet above the village; neat stonebuilt houses, two chapels, several shops, a tavern and an imposing town hall were geometrically arranged on a T-shaped ground plan. It was hoped that the new township would become a centre of culture in North Wales. In February I812 a near disaster had been averted. High spring tides breached the embankment and the whole project was only saved by a massive effort from the locality, with no less than 892 men and 727 horses coming in response to the call for help. The effort however nearly bankrupted Maddocks and when Shelley arrived the scheme was in dire financial straits. He was immediately enthusiastic about the whole new town and land reclamation project, seeing it as a practical experiment in forming an ideal community and a chance to reform both man and his surroundings. Renting a local house, Tan-yr-allt, Shelley threw himself into fundraising on Maddocks’s behalf. He spent six months chasing up the promises of funds from local farmers and businessmen with the zeal of a new convert. This did not endear him to some influential locals and neither did his vocal support for the Luddites, and local rioters. Amidst stormy weather the following February Dan Healy arrived in Tremadoc fresh out of Barnstable gaol. Shelley welcomed him with open arms. – What happened next has been open to wild speculation ever since. Seemingly expecting some sort of trouble Shelley retired that night with loaded pistols at his bedside. In the night the house was broken into and an apparent assassination attempt made on Shelley’s life. Whether a Home Office spy had followed Healy from Barnstable, or it was an attempt by local businessmen to scare Shelley off was never discovered – it has even been suggested that the whole event was a fabrication or hallucination on Shelley’s part. Whatever the truth Shelley and his companions left the next day never to return. The building of Telford’s suspension bridge over the Menai Straits eventually swung things in favour of the northern route to Ireland with Holyhead as the port, leaving Tremadoc somewhat stranded in a backwater. However the redirecting of the river Glasyn had unexpectedly carved out a deep channel in the sands enabling the founding of the port of Porthmadoc, which would flourish as the major port of export for Welsh slate following the building of the Blaenau/Festiniog railway along the Great Embankment, . Years later Shelley would make one last attempt to establish an egalitarian community. On the shores of the Mediterranean he would attempt to knit together a literary colony with his second wife Mary (the daughter of Mary Wollstencraft and William Godwin, & author of Frankenstein), Lord Byron and other friends – an attempt that would be cut short by his untimely death in a boating accident. Queen Mab was to be Shelleys’ most widely read and influential work,Circulating in numerous cheap pirate editions and finding its home not in the rarefied world of literature but as a basic text for the self-educated working class. Owenites and Chartists took inspiration from its revolutionary message. Copies would reach radicals in America and on the continent and in 1848 a young Frederick Engels would begin a translation into German. On 5 July 1969 Mick Jagger of the Rolling Stones read a small part of Shelley’s poem ‘Adonais’ at the memorial concert for Brian Jones in London’s Hyde Park. This entry was posted in communal connections and tagged Shelley by chris-coates. Bookmark the permalink.